Paperback, 284 pages — now also available as e-book! Computers are used in many areas of science. Basic programming skills are taught in virtually every science course today. However, these courses are often still somewhat of a "second class citizen" at many science faculties, and most "beginner level" programming books do not focus on scientific use. This book presents the basics of computer programming in a way that satisfies the particular needs of science students, while at the same time clarifying concepts from a software engineering and computer science point of view. No prior programming experience is required to read and understand this book. It starts "from scratch". Creating and running programs on Windows, Linux, and Mac OS X is covered. 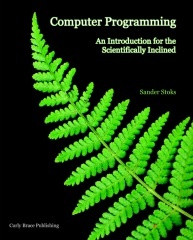 The language used in this book is C, the "lingua franca" of computer programming. It covers ANSI C and C99. With chapters on computer graphics (including how to generate your own) and scientific simulations, it presents material which is directly useful to the science student. Also includes an overview of available libraries, where to find them, and how to use them in your own programs. The full table of contents is listed below. A three-chapter excerpt (chapters 1, 2, and 9) of the e-book version can be downloaded from here (note that this excerpt is specifically formatted for small screen digital e-book reading devices, so the page layout is different from the paperback version.) An HTML version of Chapter 1 is available online here. 0.2 Why Another Programming Book? 1.1 Do You Need To Know?